~Knight~ Seal Mitted Ragdoll owned and loved by Heidi Hurtis. Shown here cuddling with Heidi's grandson. ~Cloud~ Lilac Lynx Point. This beautiful kitten belongs to Paula Heiser. ~Max~ Blue Lynx Point Kitten. Has fit nicely into his new home. I'm so happy I could help Santa with this wonderful Christmas gift. I am my own best customer. This is Tucker a chocolate lynx point male, my personal pet and official cattery mascot. I love this super sweet boy! This is Teddy a chocolate mitted lynx. He is owned by Fred Lewis. Jenny (seal lynx bicolor) & Friend cuddling, owned and loved by Thomas Boyland. Isaac (seal lynx bicolor), sleeping on the family dog "Seth". He is owned and loved by Kathleen Travers. A super sweet kitty. ~ Kalei & Leilani ~ Loved by Eric and Cathleen Boegel. ~Niko & Kirby~ Owned and loved by John and Carla Salzwedel. Thank you Ann for breeding such an amazing cat! Merlin has brought more joy to me in the past four years than I can measure. I am so proud to say that Merlin is now a weekly visitor to the Jones-Harrison Residence, and he is brightening the lives of everyone he meets. Merlin is special beyond belief and I am proud to say that he is my boy! With this email I wanted to let you know that Merlin is a new Delta Pet Partner and he is really making a difference in peoples lives. Vanessa Ervin. ~Mater~ Seal Bicolor. Loved by Derek & Melissa Bell & family. ~Missy~ Chocolate Point Mitted. Loved by Lisa Petter & family. 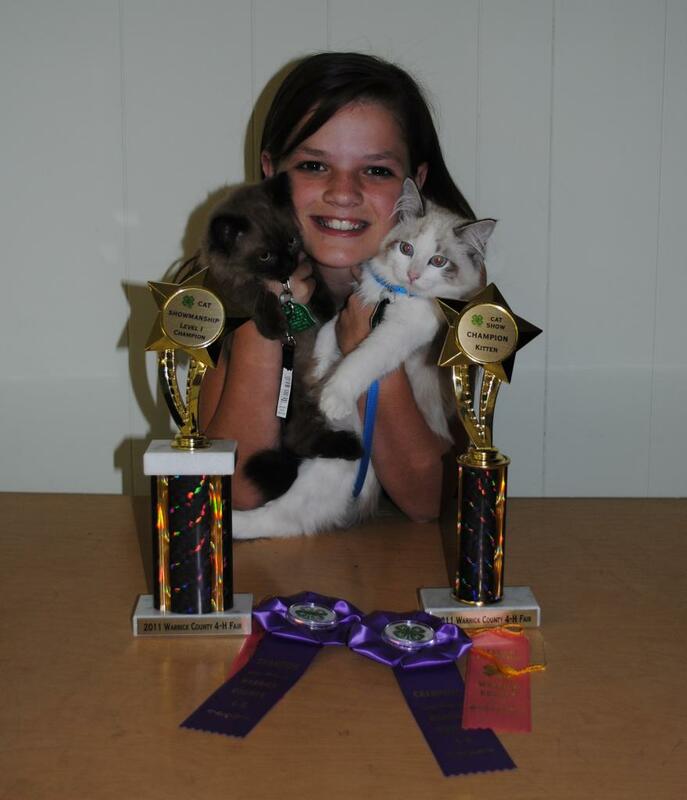 Starliterags Romeo (on right) wins big at his first show at the county fair! Champion and Reserve Champion for Best of Show. Owner Sabyn Rudolf. Indiana. 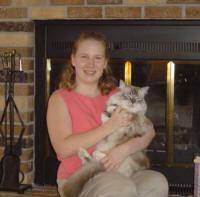 Bella ~ Hi Ann, I purchased my ragdoll kitten from you in 2004. She was shipped to the Providence RI airport when she was approx. 4 months old. We immediately named her Bella as she was by far the most beautiful cat we had ever seen. Her personality is incredible. She is sweet, floppy like a ragdoll should be and as gentle as can be. Everyone that comes to my house is mesmerized by her beauty and elegance. We added a shih tzu puppy to our home 3 years ago and the adjustment was seamless. They took to each other immediately. I am forever greatful to you for breeding such amazing cats. Judy Barrette. This is Lily and Abbey. Ragdolls can get along famously with dogs. Two best friends taking a nap. I can't remember who the owners are. Please contact me if you want your name included here. ~Suzy ~ Lilac Mitted Lynx. Dearly loved by Alison Spotts. "Izzy Saves the Day" Hi Ann, I want to share with you something that happened yesterday. About mid morning Izzy was sitting on the kitchen floor looking up at the counter meowing like crazy, she would then look at me . For the life of me I could not figure out what was wrong. A short time later I went into the kitchen to make coffee, as I was filling the carafe I noticed some smoke coming from the cord. When I touched the cord I got a small shock, so I quickly unplugged it, as I did that a small flame burst from the cord. I have no doubt that Izzy could smell or sense something and was wrong and was trying to tell me about it. Before I got Izzy I could not imagine how much I would love her. Thanks so much for this precious addition to our family!!! Patty Button. Miki has been with us for more than ten years (DOB March 3, 2002), and is still as sweet and lovable as the day we brought him home. He is an important member of our family and we love him dearly. Everyone who meets him is taken in by his charm. Thank you for providing us with such a wonderful companion. He really is the best! Regards, Sonja Vujatovic. ~Hershey~ This big furry bundle is loved by Mike & Rebecca Markvart. Dear Ann, Here is my beautiful girl! She is so special. Seal Mitted Lynx. Loved by Carrie Hogan. Diamond (seal mitted lynx) on left, and Macho (seal mitted) Ragdoll kittens are owned and loved by Bud & Julie Wood & family. Here they are all cozy with the family dogs after only one day in their new home. I think that's pretty amazing! Welcome to our satisfied customers page. This page is continuously under construction. I will be adding more pictures soon. I will be happy to post it here. Please include your name, and your kitty's name, along with a short paragraph telling us about your Ragdoll. Don't be shy, get in the picture too! We feed and recommend Life's Abundance Premium Cat Food.